Advanced Vision Care is world renowned for our advanced vision correction treatments. In keeping with our reputation, we have launched the most advanced Refractive Lens Exchange/Lens Replacement surgery suite available in the world at our eye clinic in Harley Street, London. The spirit of Advanced Vision Care is to be at the vanguard of vision care technology. Our current medical equipment is sourced from the leading vision care manufacturers including Carl Zeiss AG, Baush & Lomb, Zyoptix, Alcon, Intralase, Technolas to name but a few. Our current technology mix ensures that every vision correction treatment we undertake is a success with excellent outcomes for our patients. AVC now has the technology that can track your eyes correctly to know exactly where the blood vessels are located in the eye – a fantastic tool for any eye surgeon. Our tech can map the exact location of any blood vessel and provide photos of every individual blood vessel’s location. Furthermore, it also provides our surgeons with the precise information of where and from which angle to operate on any eye. Better still, our cutting edge refractive suite can now create a complete surgical plan during an initial eye assessment, minimising the possibility of any errors going unnoticed or untreated. Our new refractive suite combines cutting edge technology with intelligence for outstanding vision correction results, so that we are able to provide both laser and non-laser vision correction treatments under one roof. Our investment providing A-rated technology to our surgeons means that we can treat more and more complex procedures with successful outcomes. Advanced Vision Care is the first eye clinic in Europe to have state of the art equipment – a phacoemulsification system which breaks up and removes the natural lens, allowing for smaller and more precise incisions. This enables our surgeons to optimise every phase of the lens removal process. This device provides ultimate control to our operating surgeon as the intraocular pressure is controlled throughout the surgery. 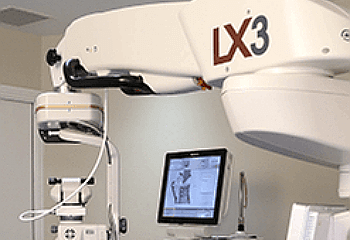 Combine this with the Lux-OR LX3 with Q-VUE Ophthalmic Microscope – the most advanced ophthalmic three dimensional microscope in the world, and our surgeons can project a digital map of your eye to overlay on to the operating microscope during any surgery. Lens quality is of paramount importance at AVC, so all of our lenses are designed to suit every individual patient’s personal requirements. For this, we provide multi-focal and tri-focal IOLs which enable our patients to be completely glasses-free after treatment. These lens implants help our patients to completely free themselves of prescription glasses and contact lenses as they enable simultaneous correction of all fields of vision. At AVC, we are able to provide the largest selection of bespoke lenses available at any clinic in the world, which is why we are able to correct any prescription range and are able to treat many patients found unsuitable for treatment at other clinics. This is why patients come to AVC for vision correction treatment from the far corners of the globe.